Sreemoyee Piu Kundu, an Indian author, pens an incredibly heart-touching desi love story, You've Got the Wrong Girl that unfolds the story of a best-selling writer who pens a book about his unusual yet memorable and romantic experience with an unknown woman whom he met on his friend's wedding night, but now he is being forced to write the sequel to his book, and for that he needs a story line, meaning which he needs to find that girl. On a sultry night, on a deserted lawn overlooking a moonlit Taj Mahal, two strangers make passionate love and promise never to meet again... But promises are meant to be broken, right? This is the story of Dushyant Singh Rathore - the 30-something bestselling author of Kinda Cliched, a blockbuster romance novel based on his one night of bliss with a girl whose name he does not know. Under pressure to produce a money-spinning sequel - from his obsessive fans, his hit-seeking publisher and a skeptical journalist ready to expose the true-story angle as a marketing gimmick - he sets off, three years on, to find the elusive girl whom he had promised never to seek out. When his quest, many twists and turns later, leads him to the unlikeliest of places, Dushyant discovers there's a little more to this love story than he had anticipated. Will Dushyant get a second chance at love? What if the wrong girl was really always the right one for him? 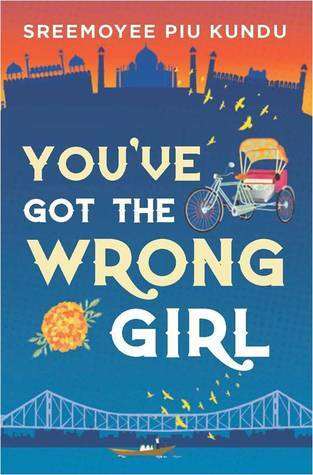 Three years later, Dushyant Singh Rathore is on a journey to find the "wrong girl" whom he promised that he would never look out for. The pressure is on from his publishing head, from his beloved fans and from a typical black-mailing journalist to write the sequel to his hit book, Kinda Cliched that was not only a best-selling book, but has also been made into a movie by none other than Karan Johar. 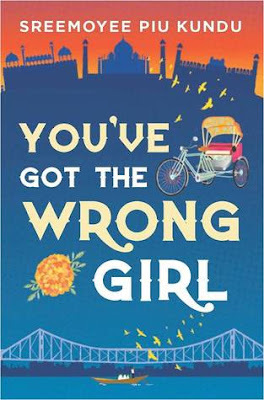 Thus Dushyant embarks on his challenging way to find this girl who stole his heart three years ago on his friend's wedding night, and to find her he needs to travel back to the same place where it all began- Agra in New Delhi. But will he be successful in finding this "wrong girl"? Firstly I must confess before writing this review that I'm not much of a big fan on reading Indian love stories, but thanks to Sreemoyee Piu Kundu who changed my perspective after reading this quirky, new-age yet realistic love story. The author's writing style is really fantastic and articulate and is laced with lots of emotion. The narrative is catchy, genuine and quite arresting that will immediately draw the readers deep into the core of this story. The story is quite addictive from the very first page itself, moreover inspired from the reality and that really plays the trick to keep the readers glued onto the edge of their seats all throughout the story. The pacing is really fast despite the fact that the author has penned this story with lots of in-depth detailing and layering. This story is a far cry from the traditional cheesy and predictable Indian love stories as there are quite a lot of twists in Dushyant's story that will keep the readers anticipating till the very end. Set against the glittering yet mesmerizing backdrop of the Taj Mahal in Agra, the story itself adds a charm. The author has vividly captured the picturesque backdrop of not only the beauty of the Taj in Agra, but has also captivated the streets and lanes of Kolkata and its sweetness strikingly. And yes this book is a real treat for those who want to taste Kolkata in an unique and a new way, the Kolkata that is hidden away behind the old houses and the ghats. The characters are really well-developed by the author. The author has portrayed the demeanor of each and every character in this story with originality and honesty. The primary character, Dushyant is an interesting character, not that cliched yet acts like a typical Indian man when it comes to expressing the true feelings of his heart. But his caring and sometimes confused attitude will make the readers fall for him and keep them rooting for his till the very end. Moreover, the author has captured the voice of a thirty year old Indian man whose heart is in an emotional turmoil, quite strikingly. The supporting characters especially the publicist of Dushyant, a funny man who will crack up the readers a hell lot of times, the female characters and the rest of the characters are pretty well etched out and depicted into the story line. The author has rendered the love story with lots of sizzling passion, that is bound to make the readers feel the heat off the pages from the book, heart-felt and affectionate emotions that is also bound to make the readers fall in love with the idea of love yet one more time. In a nutshell, this is a captivating, soul-stirring yet unusual story where the boy chases the "wrong girl", that will keep the readers engaged until the very end. Verdict: Definitely a must read and you seriously need to look out for this talented author. Courtesy: Thanks to the publishers from Hachette India for giving me an opportunity to read and review this book. So now that you've read the review and by now you must be dying to get your hands on this book. Do not worry my friends, as Hachette India is hosting a fabulous giveaway with an attractive and irresistible prize. Enter through the below Rafflecopter. • The giveaway prizes will be provided by Hachette India, subject to availability. • Hachette India is not responsible for prizes that are lost in the mail. • The giveaway will be in India ONLY. • Any disputes arising from this contest are subject to jurisdiction in Delhi. • Winners will be determined by the management of Hachette India. The decision of the management will be final and no queries will be entertained in this regard. • The entries may be screened for defamatory content/language. Hachette India reserves the right for last minute cancellation and change in terms and conditions. • Participants should be Indian residents. • The contest will start on 10th March 2016 at midnight and end on 30th April, 2016 at midnight. No late entries will be accepted. • Each winner will get a total of two books, subject to availability. • All entries that are only entered in the Rafflecopter widget will be valid. • Number of entries for each task has been provided in the Rafflecopter widget. Every person who enters the giveaway needs to do at least one task that is listed above for their entry to be valid. • Winner has 48 hrs to respond to intimation by Hachette India before another winner is chosen. • Facebook, Twitter and Google+ are in no way associated with this giveaway. • Blog Tour hosts cannot enter the giveaway. • The same giveaway is being hosted on all blogs. There is no separate giveaway on all blogs. Hurry today is the last date! Sreemoyee Piu Kundu has been a lifestyle editor and PR head, and is now a fulltime novelist based in Delhi. She is the author of two novels, Faraway Music and the bestselling Sita's Curse, and has completed her fourth novel, Cut! She is working on a political tragedy titled Rahula and her first non-fiction title, Status Single, will be published in 2016.